Back by popular demand, A Very Merry Unscripted Christmas returns to Modjeska Playhouse for its third year! 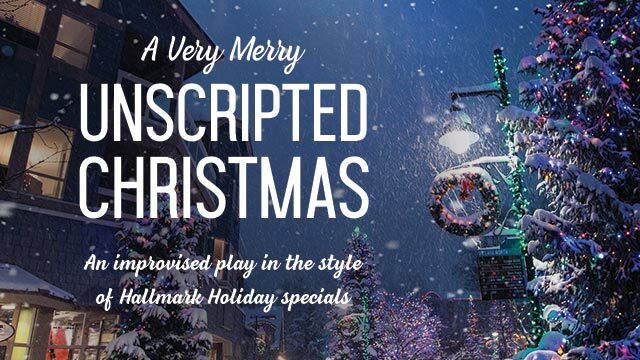 Watch as our talented Modjeska Unscripted Theater (MUT) cast create 16 original plays, completely improvised on-the-spot in the style of the most beloved holiday guilty pleasure: Hallmark Holiday Specials. 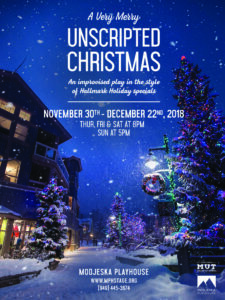 Using audience suggestions, our Modjeska Unscripted Theater (MUT) cast will create a full-length play based on the made-for-cable Christmas movies that air on the Hallmark Channel every holiday season. Each play will be full of festive spirit, Christmas magic, and maybe even a touch of romance! The cast and the audience never know until it happens! No show is the same, each play will be performed once – and ONLY once – and will never be seen again. Don’t miss out or you may end up on the Naughty List! $20 Preview Night – Thursday, Nov. 29 at 8 p.m. Opening Night Reception – Friday, Nov. 30 at 8 p.m.